Today we’d like to introduce you to Robin Howard. Robin, we’d love to hear your story and how you got to where you are today both personally and as an artist. I grew up in relative isolation in the rural Midwest. Though I spent most of my time escaping into books and plotting what I would do when I got old enough to leave, it turned out to be a lucky upbringing. All of that solitude allowed me to develop independently of outside influences. As a result, I have always been on my own trajectory. I have assembled things as long as I can remember. They were less like art and more like small alters, totems or collections of symbolic objects that told a story. My dad was a carpenter, so I had access to his scraps and tools. 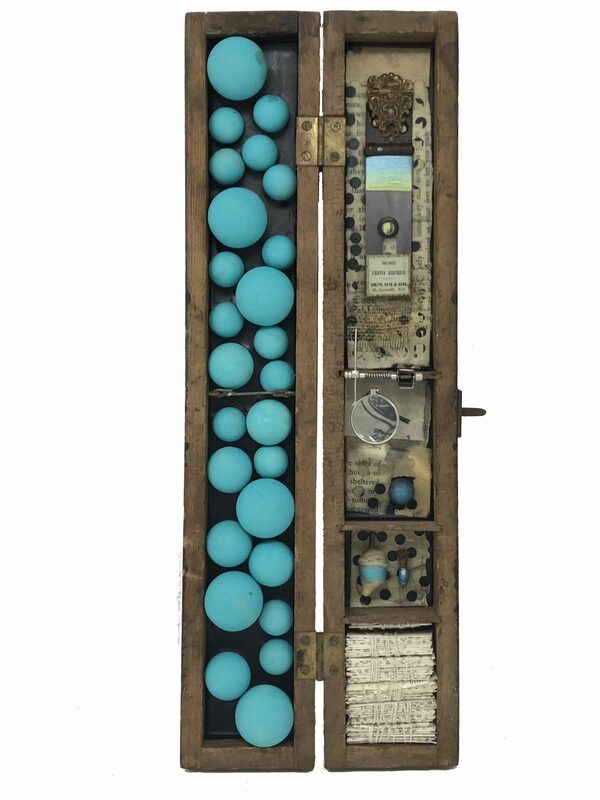 I loved collecting little bits of broken things and making small boxes for them. 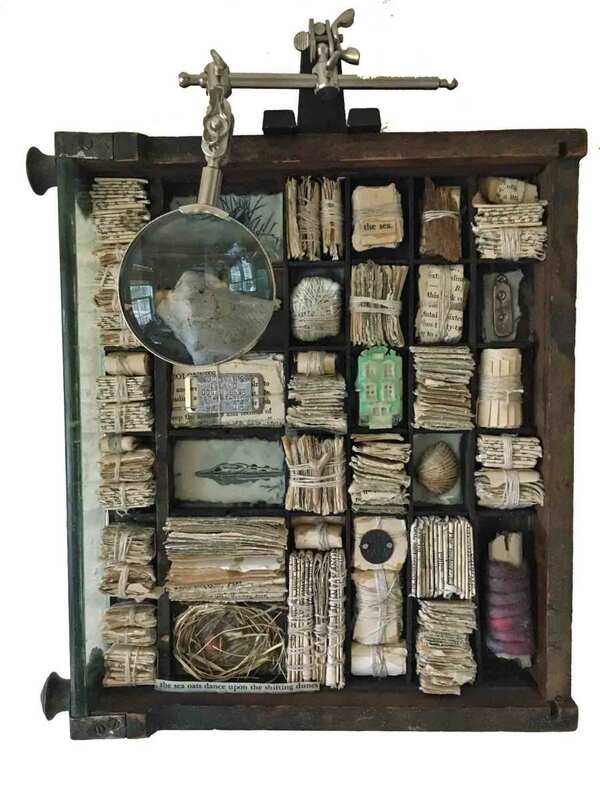 I didn’t see assemblage art until I was in college and discovered Joseph Cornell and Robert Rauschenberg. Finding a label for what it is that I was doing was validating. By then my style had developed in a vacuum though. I don’t have the frenetic energy of Rauschenberg or the straightforward interpretations of Cornell, though I do wonder how my work would be different if I’d known about them earlier in my life. My first foray into making a life as an artist was through papermaking. On weekends I studied at Columbia College in Chicago after getting a degree in Anthropology from Indiana University. I built a 6’x 6′ paper mold in my basement and started making enormous pieces of handmade paper art. I even taught papermaking at an HIV+ arts co-op in Kenya. After I came back from Africa, I started showing in exhibits. Because there is always a deeper social, cultural, or metaphysical narrative in my work, I got to do a lot of public art such as window installations. In 2012 I moved to Charleston, South Carolina – my ancestral home. I was immediately in deep communion with the sea and nature like never before in my life. 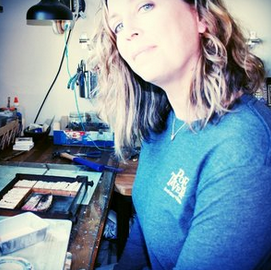 My work changed to reflect the beauty and mystery of the Lowcountry, and I am enjoying art in a whole new way. 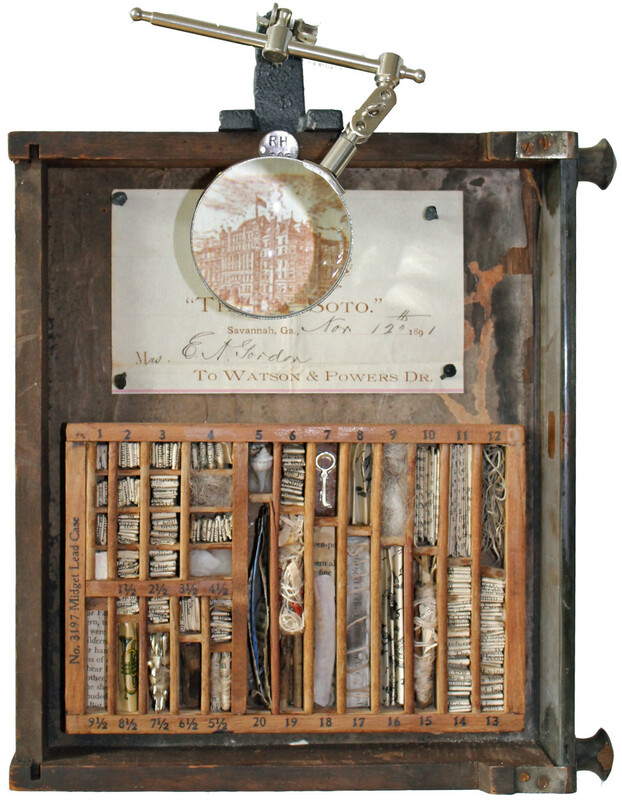 I make assemblages from found and altered objects. 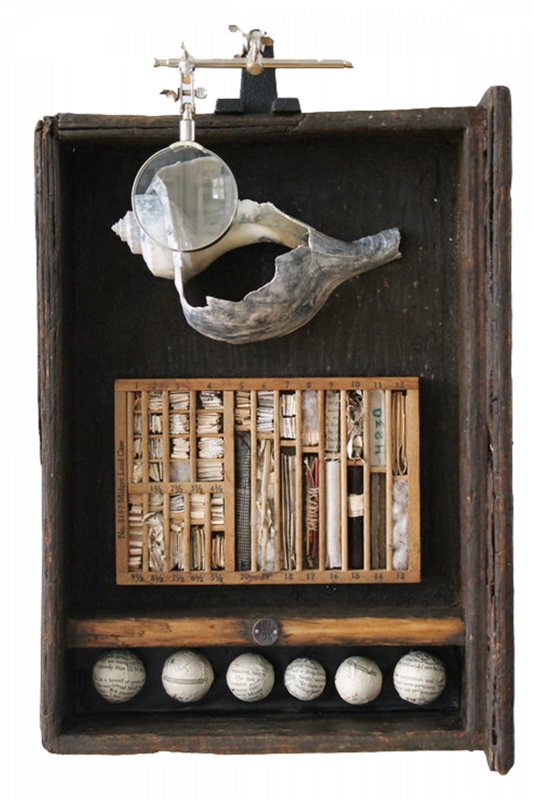 Most of my works are created inside small vintage wooden boxes. They’re an encapsulated universe, like a snow globe. My primary materials are encaustic (pigmented beeswax), found objects, fiber, metal, wood, and oil stick. Over the years I’ve formally and informally studied everything from math and chemistry to ceramics, textiles, and printmaking in the pursuit of innovating. Today I work primarily with encaustic (pigmented beeswax), wood, textiles, handmade paper, and found objects. I am learning to draw, and raw sketches are starting to sneak in. I have always expressed myself in symbols, and every piece is still a small altar or totem, like when I was five. I have always made art to capture small moments of wonder, awe, mystery, and delight. For adults, moments of surprise and delight are so rare. I began attaching magnifying glasses to my work because it stops people in their tracks. The call of a magnifying glass is irresistible, whether you’re five or 50. I love watching people study all of the intricacies in one of my boxes or sculptures. Whatever they’re thinking about, they’re not thinking about work or laundry or the mundane. For a minute, they’re five years old again. 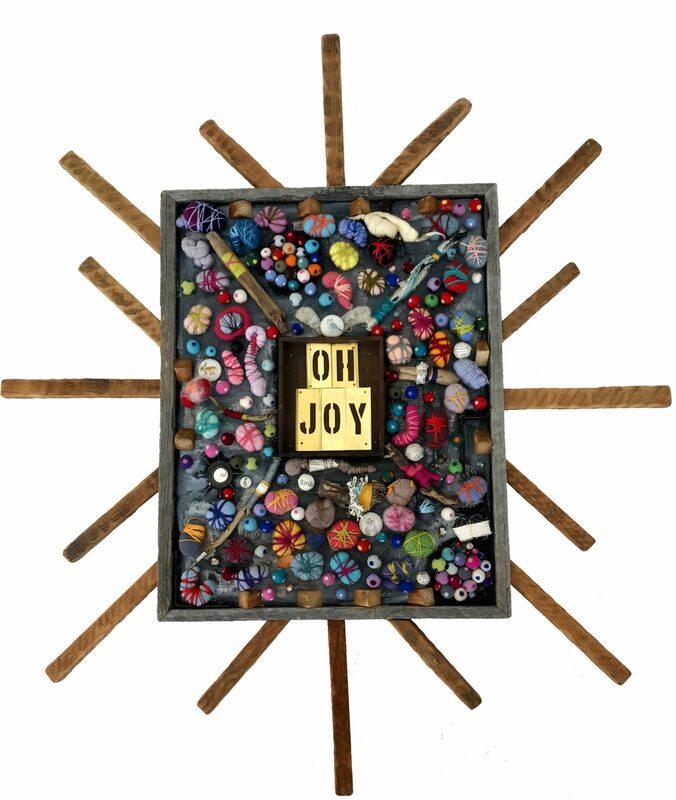 I made assemblage art when I was little to delight myself. I make it now to delight others. The ability to make a living. You can see my work online at www.robinhowardart.com. In Georgia, visit the Roots Up Gallery in Savannah. White Oak Kitchen & Cocktails in Atlanta has several pieces in their permanent collection. 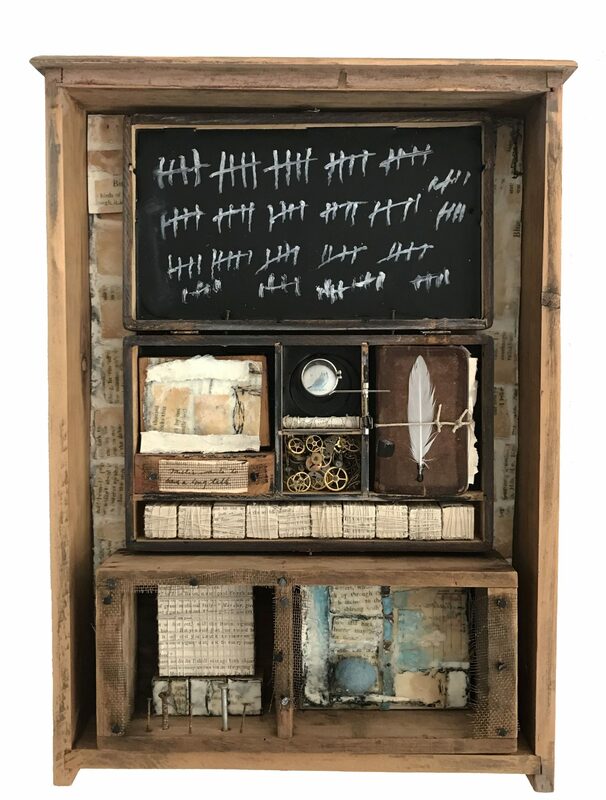 In Charleston visit the Miller Gallery, Art Mecca of Charleston, The Vendue Art Hotel, or the Show & Tell Gallery on Sullivan’s Island – online or by appointment.